Peter Sacks at his solo show, “New Paintings,” at the Paul Rodgers/9W gallery in Chelsea. PERHAPS one place to start when trying to account for the singular, layered power of Peter Sacks’s paintings — the way they suggest a meticulous, almost penitential attention to detail even as they convey a larger visual narrative — is with the walks he took growing up in South Africa during the 1950s and ’60s. It was on these walks around the Drakensberg Mountains that Mr. Sacks, the son of liberal white parents (his father, a renowned doctor, taught in a black medical school), encountered ancient cave paintings made by the original South African bushmen. “Se Questo è un Uomo (Primo Levi),” from 2009-2012, 76 ¾ inches by 153 ½ inches, mixed media on canvas. At some point, around the age of 16, Mr. Sacks began a lifelong habit of keeping notebooks on his walks, wherever they led him, and sketching and writing about what he saw — “to capture,” as he said, “what otherwise might be fugitive in experience.” And during the nearly 45 years since, he has continued to be absorbed by the potential of words and images to not only address the ravages of history but to offer consolation. In an artistic career that began with a 14-year stint as a poet and then took an unexpected and vigorous turn toward painting, Mr. Sacks has used his finely tuned ear and eye to render the enigmas and horrors of the world as he sees them. His latest works — 21 paintings now on view at the Paul Rodgers/9W gallery in Chelsea — call on both faculties, combining carefully chosen texts with semiabstract imagery to evoke the subjects and themes that have preoccupied him since youth. He went to Princeton, spent three years in Oxford on a Rhodes scholarship, then returned to the States for graduate studies in English at Yale. His doctoral thesis became a book about English elegies, and he taught literature at universities including Johns Hopkins and Harvard, where he is now a tenured professor. He also wrote five well-received collections of image-driven poetry; the second, “Promised Lands” (1990), won praise from his fellow expatriate writer J. M. Coetzee, and the last, “Necessity” (2002), was greeted as “an extraordinary meld of acute perception and formal resource” by the poet Robert Creeley. None of this suggested what would come next, the radical shift in interest and aspiration that would move Mr. Sacks, going into his fifth decade, from the page to the canvas. Turning to his tried-and-true pastime, he took walks — often 30 miles long and sometimes through the night. In lieu of writing, he got a disposable camera and started taking snapshots of the countryside. But feeling that the pictures didn’t capture what he was experiencing, he took a bottle of Wite-Out and, in a “reverie of erasure,” started “systematically” whiting them out. Then, deciding the images needed more color, he made vegetable dyes, mixing mustard, pimentos and coffee with Wite-Out. He returned home to Cambridge, Mass., with a shoe box full of photographs — “They were the first works outside the books” — and a new conviction. “I felt the courage to go out and buy canvas,” he said. From there on in, a painterly vision began taking shape, if not quite fully formed then remarkably assured for someone whose only formal training was a couple of drawing classes. In 2001 Mr. Sacks and Ms. Graham moved to Normandy part time, and he set up a studio there; he worked on midsize and multipaneled oil and acrylic paintings, some done with a palette knife. Three years later he had his first show, in Paris, which featured semiabstract paintings steeped in his conflicted relationship with South Africa, the ravishingly beautiful landscape juxtaposed with the barbaric inhumanity. These works incorporated materials like burnt linen, bits of cardboard boxes and old newspapers; their implicit themes were unironic, even anguished, having to do with global suffering, displacement, imprisonment and exile. Only one work bore a trace of Mr. Sacks’s deep roots in literature, the word “Zeugnis” (from a poem by Paul Celan) in foot-high capital letters. By his second Paris show, however, Mr. Sacks’s abiding passion for writing had reasserted itself. He had begun laboriously typing out columns of text by Kafka, Yeats, Osip Mandelstam and other writers on fabric, using a manual typewriter. After typing a passage from Kafka’s “Trial,” he recalled, “I turned it upside down on the floor, and it looked like a human form.” A similar thing happened with Yeats’s “Tower,” creating a spectral shape made up of words. This approach made for a seesawing interplay of the textual and the visual in his work, one that gives viewers the freedom to decipher text or merely pass an eye over it. It’s a dynamic apparent in the paintings on view at Paul Rodgers/9W, which attest to Mr. Sacks’s continued interest in forging a visual language that incorporates writing without being dominated by it. 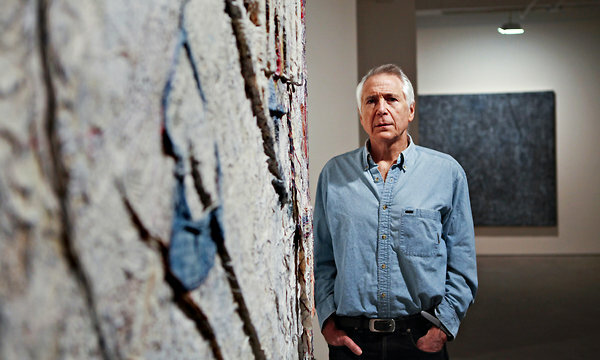 (His first exhibition at the gallery, in 2009, sold out, with paintings being acquired by several major museums as well as private collectors.) 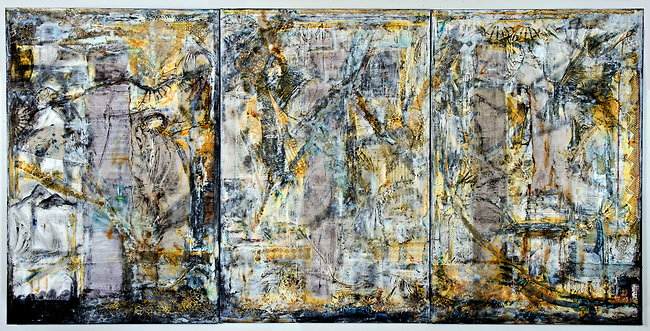 The works, which include three triptychs and a group that are six feet square, draw once again on his collagelike use of humble materials (antique linen and lace, cardboard, thread, buttons, netting, wood) and of typed or handwritten texts (entries from Virginia Woolf’s diary, prose by Primo Levi, letters from soldiers at Gettysburg, documents like the Geneva Convention). This time, though, the texts are not confined to columns but wander through the paintings like rivers or mountains. And for all their intellectual underpinning, the works as a whole carry an emotional heft rare in today’s art world. One piece, called “The Trade,” includes notations from a slave ship logbook, recording exchanges of goods — “1 doz muslin handkerchiefs,” “720 ‘worsted caps’” — for humans. 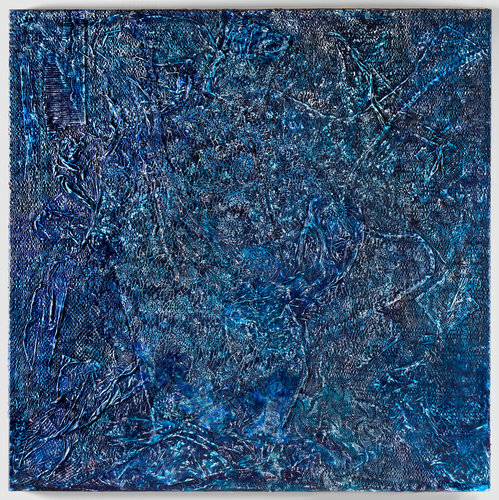 Another, “Durban Point (Indian Ocean),” suggests a swirling body of water, until you step closer and realize that various materials and texts have been embedded under a thick coating of blue paint, like sediment on the ocean floor, evoking the unstoppable passage of time. These days Mr. Sacks does his painting in a barn studio in Sharon, Conn., where he and Ms. Graham spend some of their time, having sold their house in Normandy. He is firm about not being seen as a poet-painter, however tempted some might be to place him in this hybrid category. © 2013 The New York Times Company.